Being one of the new 7 wonders of the world, Chichen Itza is a beautiful place to tour and is also a UNESCO World Heritage Site. There aren’t many temples left around the world in the same condition. As a religious meeting place for the ancient Mayans, it is also a place of great cultural significance. Set among a well-manicured area, you can walk around Chichen Itza and take in multiple buildings and temples. Just the natural presence around the site is very impressive in itself. The ability of ancient people to have created such a religious site is mind boggling. 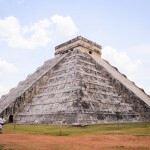 Tourists from around the world have a Chichen Itza tour from Cancun on their bucket list. This is because it is world renowned and stories of trips have made it all around the country. 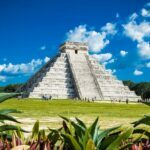 Visiting Chichen Itza will make your Mexico vacation one that you will remember for the rest of your life. The tall and daunting pyramid speaks of times long past but still remembered. 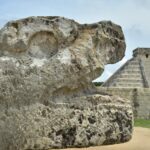 Chichen Itza is a marvelous piece of history and we offer a wide variety of tour options for those looking to take in everything that it has to offer. 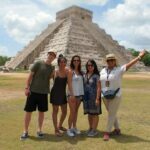 We have many different tour just options from Cancun that will leave you thrilled, excited and informed. While you may no longer be able to climb the steps at Chichen Itza, the sight is one well worth taking in. You can touch stones that are truly a part of history. You can walk in and among various aspects of the site. Each step you take will churn your imagination harder to craft a picture of what it would have been like then. 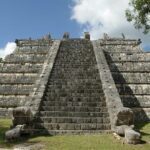 Around Chichen Itza you will have the opportunity to take in many different scenes. From the Great Ball Court, to the Temple of the Warriors, to the temple of the Skulls, to the Tomb of the High Priest, there is so much to see. Most of our tours even stop at Cenote Ik’Kil, which is one of the most famous cenotes in the world. Surrounded by rock, moss, and plants, you are immersed in the crystal clear cenote waters of the Mayans. These were sacred places for the Mayan where they would even make sacrifices to their gods for good blessings. Most of our tours will also stop in the historical and colonial town of Valladolid where you will be able to take a quick look at what the Spanish conquistadors were fighting so hard to keep in the 1800’s. All of our tours are transported in air conditioned vehicles, depending on the tour some will include onboard drinks, onboard bathroom, or even a breakfast. 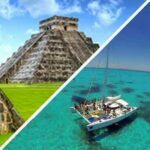 Just take a look and see which Chichen Itza tour from Cancun that will work best for you and we’ll take care of the rest! 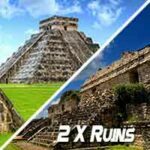 If you want to see other options you can compare chichen itza tours with competing companies below.